By the end of the current accounting period, you can optionally transfer all the sales transactions from the Sales History Transaction file into the Sales History file. Sales History file is the basis to support Sales History Report and provide comparison for Sales YTD and Last Year to Date, as well Sales PTD and Sales Last Year PTD. If you are looking for 12 month comparison report, your best bet is to use report writer to develop a cross tab report base on Sales History Trx file. For this reason, we suggest you to keep Sales History Trx file data for at least two years. For security reason, the purge option can be turn off in Global Setup User Purge Control. Post/Purge Sales History Trx transfers data from the transaction records into the current period date fields in the Sales History file. If February is the current period, the sales history data would be posted to the February period of the Sales History file. It is important to post all of the transactions for a period before moving on to the next period since any transactions that get left behind will later get posted to the next period. For instance, if you enter a cut off date of February 27, during the post and there are transactions dated February 28 on file, those from the 28th, will not get posted. Later, when posting March transactions, you will enter a cut off date of March 31, and the transactions from February 28 will get posted at that time. When you perform this posting, a journal will automatically print out which lists the sales transactions that were posted. Also, you may optionally purge sales transactions from the Sales History Transaction file during the posting, or as a separate function. Once transactions have been posted, the system will not post them again, so you need not purge the records immediately if you wish to retain them for printing the Edit List. Frequent purges of this file are recommended, however, to prevent the file from becoming unnecessarily large. 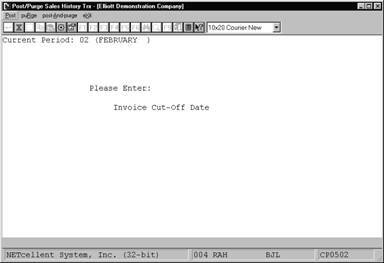 * The menu bar enables you to Post, Purge, or Post And Purge the Sales History Transaction file according to the displayed invoice cut off date. * When one of the preceding options is selected a prompt will appear that asks you to confirm the function that was selected. 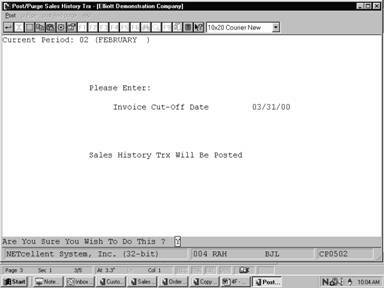 * A Sales History Journal will print out automatically when a posting is done, showing the sales transactions that were posted. 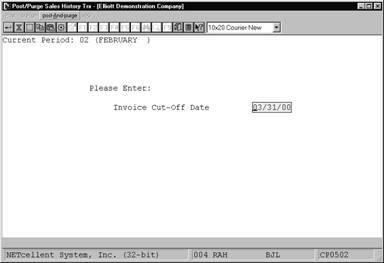 Enter the invoice cut off date. All sales history transactions dated on or before this date will be included, except those that have already been posted but not yet purged.